[J. Phys. Chem. Letts. 3, 463 (2012)] The hydrogen fuel cells convert chemical energy stored by hydrogen molecules into electric energy and the only product of this reaction is clean water. However, large-scale practical applications of these very promising sources of clean renewable energy are still restricted by unacceptably high cost of platinum-based catalysts that are used for the energy conversion. It is thus not surprising that during the past decade many research groups over the world are searching the ways to replace the scarce and expensive platinum with more cost-effective materials. This is very challenging problem because most of materials are not stable in the reaction environment. In the recent work in reference , I, in collaboration with Prof. S. Stolbov, have proposed a revolutionary approach to the problem. In this approach, the catalyst is designed in the form of tri-metal sandwich-like structure. This structure is designed so that catalytic properties of the upper active element are tuned by its interaction with the sandwiched monoatomic layer, which in turn is deposited on an inexpensive substrate, and all three elements synergistically work to stabilize the system. In this work, I developed a very efficient methodology for selection of these three elements to make the sandwich-like structure stable in general, and in the reaction environment, in particular. This strategy required deep understanding of microscopic mechanisms of interaction between atoms in solid materials. Furthermore, I contributed to prediction of two platinum-free sandwich-like structures with promising catalytic properties. 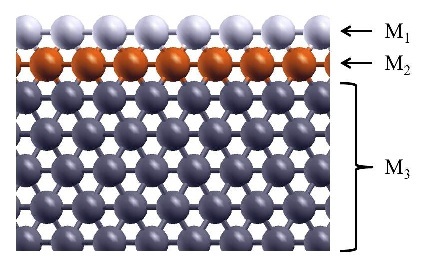 Next, computational tests performed in this work, have confirmed that these two cost-effective materials have to have catalytic activity even higher than that of platinum. Currently two experimental groups work on synthesis and characterization of these new materials. It is not surprising that this extraordinary work has received an enormous response from professional media. Copyright © 2011 - 2019 Marisol Alcántara Ortigoza - All rights reserved. No part of the materials in this website may be copied, photocopied, reproduced, translated or reduced to any electronic medium or machine-readable form, in whole or in part.